Practitioners today see increasing numbers of brain injuries across the country and around the glozbe. The causes run the gamut of human endeavor, from frailty associated with aging, military activity, sports, and motor vehicle accidents of all kinds. 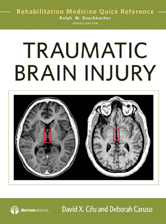 With a growing awareness of the effects of traumatic brain injury (TBI) and the need for early intervention to ameliorate these effects and improve patient outcomes have come demand for practical information for clinicians on the "frontlines."